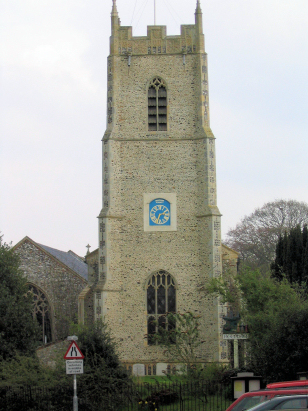 The parish of Whitwell lies in central Norfolk, the parish is unusual in that it is one of three that form the market town of Reepham and part of its adjacent countryside. Whitwell parish forms the southern part of this area and is centered on Whitwell Hall, about 1 1/2 miles south of the town and lying in amongst the lanes between the B1145 and A1067 roads. This is a gently undulating area of agriculture, cut with the streams and valleys of small tributaries of the River Wensum which runs towards Norwich a few miles south of Whitwell. 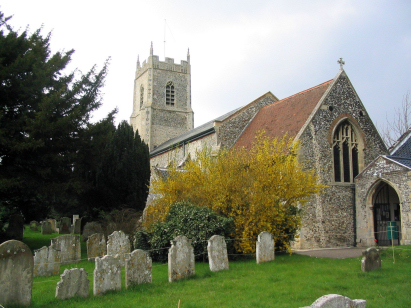 St Michael's church is one of two (formerly three) churches which are sited in the same churchyard in the centre of Reepham. Reepham's own church and the site of the the former Hackford All Saints churches accompany St Michael so closely that at times they are close to touching. St Michael's church has a bold Perpendicular tower but many of the remaining features have been masked by Victorian restoration. The interior ceiling is Jacobite. The church is no longer used for worship (Reepham's church meets the spiritual needs of the community). A single standard 800-entry register book covers not only the period of the transcript but also continues to 1888. This register is filmed on Microfiche 3 & 4 in the collection of the Norfolk Record Office and from which this transcript was prepared. Regrettably the fiche are a little aged which poor quality images by modern standards, however the images for this period are available on Familysearch and were much consulted to ensure a straightforward transcript. It is to be hoped few errors will have crept into the production.